The horses are comfortable and well-mannered! "If you enjoy being outdoors in a peaceful mountain setting, discovering new things, seeing spectacular views, and learning a bit of history, you'll enjoy a trail ride with us"
On horseback for a spectacular view! Spectacular Views of Eastern Idaho! Join us for a one-hour, two-hour, half-day or full-day ride in the Big Holes, Palisades, or Teton Crest areas in the Targhee-Caribou National Forest. Whether you choose an easy ride or a more challenging one, you'll see some of the most spectacular views of the Teton Mountain Range and a magnificent view of Teton Valley, including the Teton River winding through the patchwork design of the agricultural valley floor. Each ride is individualized for your group, time and needs. We provide a snack on the half-day rides and a good lunch on the full-day rides. 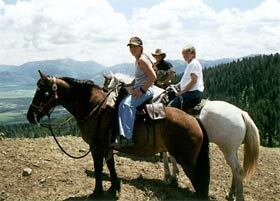 Our trail rides begin June 1st and continue through September 30th, Monday through Saturday. 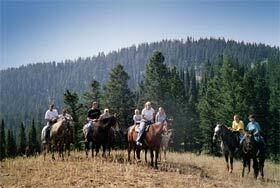 Teton Mountain Ranch is a non-discriminatory permittee of the Caribou Targhee National Forest.